If you have used the previous versions of SqlBackupAndFTP we strongly suggest migrating to v 11. How to migrate old jobs to v 11? Install the new version without uninstalling the old and all the scheduled backups will be automatically imported and backup jobs continue to run. In addition to that if you want to import some other old backup jobs (.jobx file) – use the Import feature in the menu Tools > “Import .jobx file”. If your previous backup jobs send your backups to the following destinations: Google Drive, OneDrive, OneDrive for Business or Box you need to reauthorize the connection. The reason is that an authorization token has a time limit and has to be updated. If you have paid licenses, sign in to your account with the email you’ve used to purchase the original license. If you have not logged in before of you have forgotten your password, go to Forgotten Password Recovery. 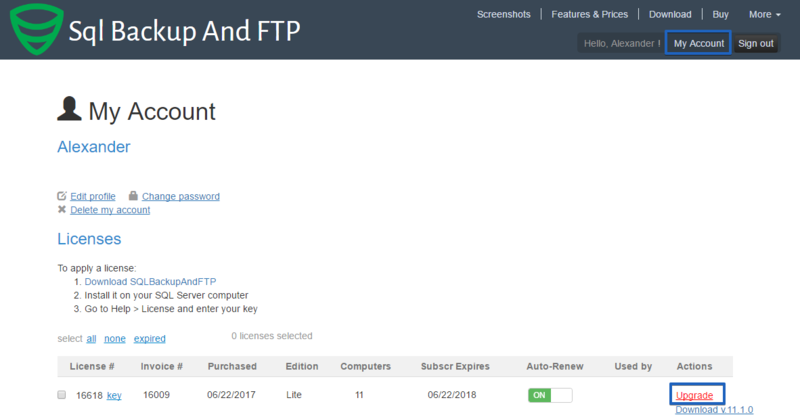 Open My Account page and find your previously purchased license keys, invoices and payments there. Am I allowed a free upgrade? If you go to My Account page, under Licenses for such licenses you will see “Download v11” links. If instead, you see button “Upgrade” next to your older license – you need to go through the upgrade process as described below. How to upgrade my old licenses to v 11? 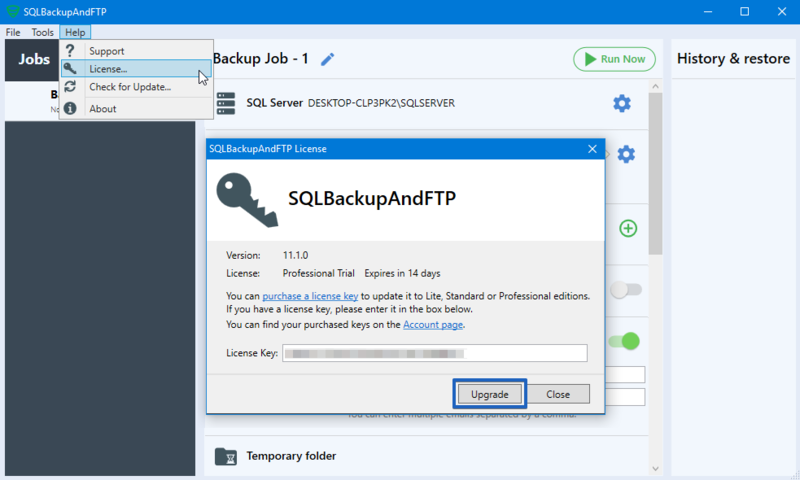 If you have purchased SQLBackupAndFTP earlier, you should upgrade your old SQLBackupAndFTP license to v 11. In the opened window select the edition you need and choose the payment method. First I used v10, and just tried v11. Awesome software you’re building by the way. Thank you. Just so you know; I use a database which has an ‘&’ in the name. This is translated to ‘&’ in v11. Therefor the program can’t find the database. Can you fix this? Thank you for the feedback! We’ll check and fix this issue as soon as possible. I would’ve appreciated an advance warning as it runs backups on a few client databases running on a live server. Can you please clarify – why should it stop working if it simply writes backups to a shared folder? Do I need to do anything? I tried to upgrade with an Amex card but it doesn’t work on your site. v11 works with Dropbox just fine, but the older version do not support the new Dropbox API. We are very sorry for the late warning about them dropping old API support, we were working on update till the last minute and just did not have the product ready in advance. If you do not backup to Dropbox directly, but backup to a folder, everything will continue working even on the old version (just note the then it is Dropbox responsible for syncing this folder and it doesn’t run when you are not logged in). We of course accept AMEX, if you got any problems with it, email to support, we will have a bunch of other options to pay. Great software thank you. In the new version I have imported the jobx files from my previous installation (I reinstalled my pc). Now the SQL connections fail. Any ideas? If not then do you have older versions available for download still because I know they work.